Sandy Clayton’s place sits on the rolling hills along Hwy 86 outside of Elizabeth and just before you get to the rural community of Kiowa, Colorado. Like most of the places along 86, Clayton’s is an acreage property with a modest house and more investment in the horse improvements. For the past two years, the Clayton’s give host to a Craig Cameron week long Working Horsemanship clinic and then finish the week with an “Extreme Cowboy Race” on Saturday. This year, for the first time ever, our own Heather McWilliams got it in her mind to enter Summer and join the contestants. Summer – our (technically Asher’s) American Quarter Horse mare is 17 and the mother of 5 foals, a competition Reiner/Eventer/Gymkhana/working cow horse and all around great South Dakota ranch bred gal – would have the opportunity to add another discipline to her growing repertoire. Asher and Heather took the opportunity to camp overnight on the grounds so the morning would be a little less hectic, then Shay and I headed out from home just after his morning nap to join them. I was told not to worry about finding the place along the road to Kiowa – the instruction was to simply “look for the horse trailers”. Sure enough, upon topping one of the many rises in the road along that stretch, I saw gleaming aluminum and steel, lots of white paint, and horses with riders scattered across the pastures to my right. Parking the car, Shay and I set out to find Heather and Asher among the array of trailers, trucks, riders and spectators. It had the beginnings of a hot Colorado morning, a slight breeze in the air, but the temperature was already 75 F by 8:30 a.m. As we passed the cook cart, the air was heavy with smells of breakfast burritos and fry oil mixing with the scent of pungent fresh horse dung. Nice. There were several classes of competition, from 1st Timer to Professional, and Heather had entered both the Novice and the Non-Pro divisions. Like almost all Western Discipline riding events, strangers meet and become fast friends as the kinship of the horse life and love create quick and fast bonds. So during the course of the day, spectators and waiting competitors all cheered each run, exhorting riders through tough obstacles and encouraging them both when they failed and succeeded. Every horse was a “nice horse” and every rider a “pretty good hand”. That said, every rider also had a passion to win. Heather was the 11th rider in her first class and as the waiting riders bunched at the entry gate to the course, me and the boys headed for some rare shade along the fence so we could watch for her and cheer her on. This also gave Shay the opportunity to meet and greet with the array of dogs wandering by looking for pats. I saw a German Shepherd, an Aussie, a Parsons Russell Terrier, at least two Cattle Dogs, one or three mixes and there also was the – Corgi headed with the ACD body – friendly girl who was available for adoption to a good home. Before terribly long it was Heather’s turn. The first challenge was to put Summer through an obstacle that consisted of a vertical PVC rectangular frame with Styrofoam swim tubes reaching inward horizontally and almost touching in the middle. The horse could not get through without feeling those fingers sliding down her flanks. Summer had to think about it – needed some extra encouragement – then walked right through. Following beyond were challenges like: wooden teeter totter bridge; maneuvering through an “S” curve of traffic plastic traffic style barriers; walking into and through a pit with a noisy tarp at the bottom and humming spin wheels on each corner; a freestyle pattern of the rider’s imagination in the arena; various jumps and then – of course – roping the stationary plastic steer head. Heather and Summer did really well. After all, it was their very first such event. By the way, competitors have no idea what the course will look like and which challenges have been picked until a walk through just before the day begins. Each class has a different course with a different count of challenges. Soon it was lunch and everyone gathered around the cook cart for freshly made burgers, brats, a ramped up cheese steak sandwich with jalapenos called The Canyon and thick, rough cut potato fries. New acquaintances and old friends alike jabbed and jawed at each other while waiting to place orders and then even longer as each item was subsequently made to order. One rider had traveled from as far as Kansas; several folks came from the Western Slope and another competitor used to live nearby but now calls Missouri home – for whatever reason that may be. After lunch a youth class went and finally it was time for Heather’s second round of competition, with the Non Pro’s. This course with 13 obstacles also started with a run through the swim tube fingers, then a canter around the barn and trips through tube fingers hanging and swinging from overhead: then a set of three jumps and into a roping arena to kick a huge red and white soccer ball down and between cones set up at the other end. After the soccer ball the horse and rider had to ride over a tarp on the ground that was being actively soaked by a large donut shaped sprinkler attached to a garden hose. I was pleased to see that Summer was the first in her class to actually get through this one – the horses before deciding this set up was too weird and scary. This time the rider had to drag two tires attached to a rope around a cone that and now the plastic steer head moved! It was attached to a motorized (and squeaky) arm that sent it into a circle. What a day! Heat forgotten. Beautiful horses, kind and gracious people, friendly dogs and rare shade from the sun. Heather and Summer won a ribbon in the Non Pro group – Yay! 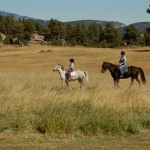 You may have heard of the Colorado Corral/MtnHomes4Horses.com Ranch Race. Well, the seed was planted for that idea in Heather’s mind while watching a video of one of these Extreme Cowboy Races. Heather explained it all last month, but you will want to mark your calendars and join us for our fourth year on September 14-15th. Either as a spectator – or a competitor. It should be cooler day – maybe fewer friendly dogs. But kind and gracious people, beautiful horses, and maybe even a cook cart. Andrew McWilliams (c) 2013. For more about Hall of Fame trainer Craig Cameron and the Extreme Cowboy Race Association, visit http://craigcameron.com and http://www.extremecowboyraces.com. The new year is underway and if you are not a member yet, the Intermountain Horse Association (IHA) is a vital group for local equine folks that you should consider becoming a part of. 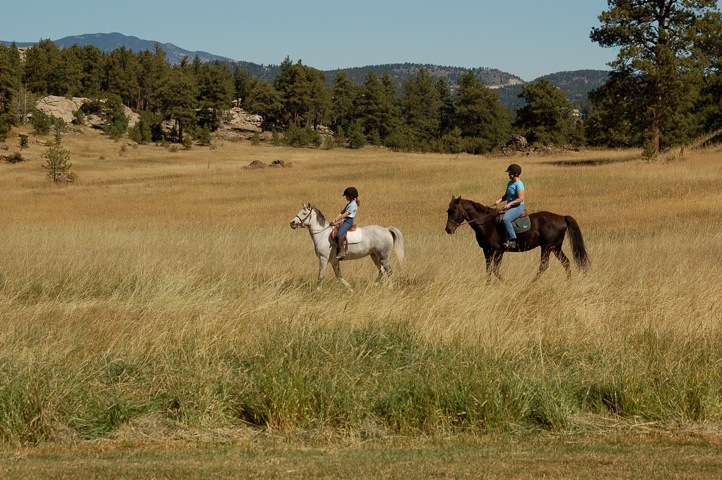 With a solid history and strong base of local horse people, the IHA traces its origin to the Rocky Mountain Riders (RMR), which was an active trail riding group of the 1980’s. At a point in time when no one could be found to fill a vacant presidency, the RMR died out and some of the members joined the Jefferson County Horse Council (JCHC) based in Golden. 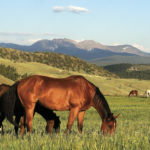 Recognizing the need to have a group in our immediate area, those members formed a branch of the JCHC, called the Intermountain Horse Council (IHC). IHC was successful for many years with a similar format as today’s IHA. IHA was formed officially in January of 2009 when the group had to become separate from JCHC when they began contributing to charitable causes. Today’s IHA serves the Evergreen-Conifer corridor and has the 501 (c)(7) classification of a Social and Recreational Club. The group meets every third Tuesday in the meeting room at Beau Jo’s Restaurant in Evergreen at 6:30pm for social and educational purposes. The business of the IHA is conducted separately by an open membership steering committee. In addition to the monthly meetings, the group puts together interactive horse events like the Poker Ride and various horse clinics as well as social events for their human counterparts such as the Summer Picnic and Winter Party. January 15th: Jennifer Benda- 2013 Tax Increases: Are you one of the (un)lucky ones? The IHA Poker Ride is an annual fundraiser in September benefitting local charities such as the Special Needs Therapeutic Riding Program of the Evergreen Recreation District as well as other horse organizations like HEAT (Horse Evacuation and Assistance Team) and Harmony Horse Works (local horse rescue). One of the most important goals of the Poker Ride though is to promote riding in our community. Of the 45-55 riders that attend the annual Poker Ride, most of them are not a part of IHA, have not been to Alderfer Three Sisters and some even travel for 2-3 hours to participate. Participants also help to act as horse and rider ambassadors to other park users. Hikers and bikers enjoy seeing the horses, riders, costumes and rigs that come to the ride. Poker Ride participants find a self-paced, social and low-key environment with a diverse skill sampling of riders and horses. Last year, my 9 year old rode his mare and I walked with our yearling filly. 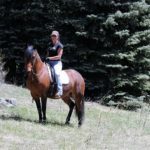 Members of IHA come from a variety of backgrounds including endurance riding, Dressage, trail riding, ranch sorting, Arapahoe Hunt Club members, reining, horse training and breeding, HEAT members, horse rescue facilitator, veterinarians and ropers. All are welcome to join. Membership is from January 1 to December 31. A family membership is $25 or individuals for $20. The first portion of your entry fee for the Poker Ride this year will pay your membership fee. As mentioned above, IHA meets at Beau Jo’s in Evergreen at 6:30pm on the 3rd Tuesday of the month. 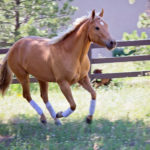 For more information go to intermountainhorse.com. Copyright © 2013 Heather McWilliams MtnHomes4Horses.com. 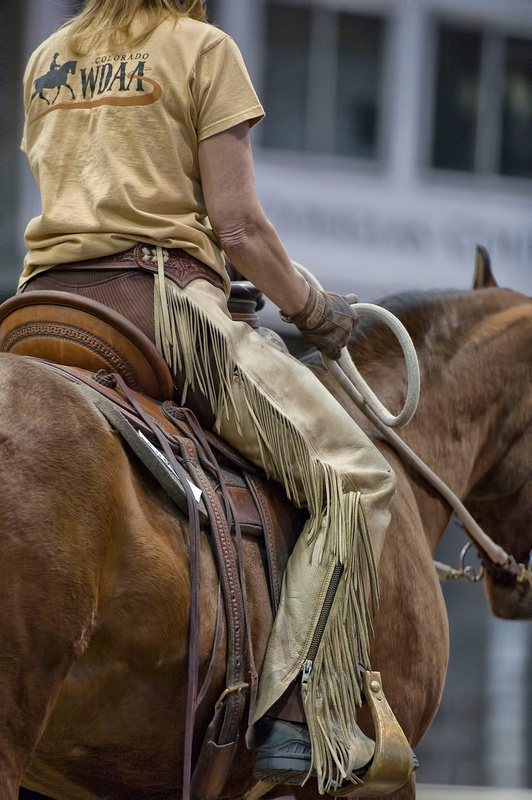 Then as the American west was settled, Western Horsemanship was practiced on the ranches of the American West and earlier still through the Spanish vaqueros. This better way of training rose to the top and became known to the horse world first through trainers like Tom and Bill Dorrance. True Western Horsemanship simply put is where people learn to communicate with the horse in their language with patience and understanding creating a willing partner in the horse. While the methods came from two sides of the Atlantic Ocean, the core values and the value of the horse stood true – inevitably, Dressage and Western Horsemanship, East and West came together to create Western Dressage. As a result, in 2010 the Western Dressage Association of America (WDAA) was created. Plus, with many local roots at the national level, the Western Dressage Association of Colorado (WDACO) was the first affiliate to be established. Our mission is to build an equine community that combines the Western traditions of horse and rider with Classical Dressage. We value the partnership between horse and rider. We celebrate the legacy of the American West. Western Dressage brings together the skilled horsemanship, history and techniques of the American west with the art, ancient traditions and systematic training of the European institutions of riding. Why is it the discipline you have been waiting for? Over the years, it is evident to me that many people feel intimidated by training, skills, showing, and clinics; but most everyone I know would like to be a better rider and partner to their horse. As a non-profit 501(c)3, volunteer run, educational organization, WDAA’s focus is the horse. They have created affordable ways for anyone, with any kind of horse, with basic western tack to improve their riding and communication with their horse through affordable clinics, training and even showing opportunities with clear and concise skill sets for any level of rider. The training world can seem overwhelming at times in any discipline and it can also seem like trainers have all been to some exclusive mysterious school where they hold the secrets hidden and only certain people can know or even understand them. Western Dressage breaks principles of riding into “skill sets”, giving an organized method of breaking skills down, all while laying the foundation to result in better communication between horse and rider. There is an entry point for all levels of riders in Western Dressage. Beginners will find an inviting, non-intimidating environment to learn in, while more advanced riders will find a supportive place to hone their skills. Skill sets are taught in a sequential manner and build upon one another. As the riders develop their skills, their horses learn to carry themselves in a more balanced, cadenced manner. Horses develop and are looked at as individuals according to their type. 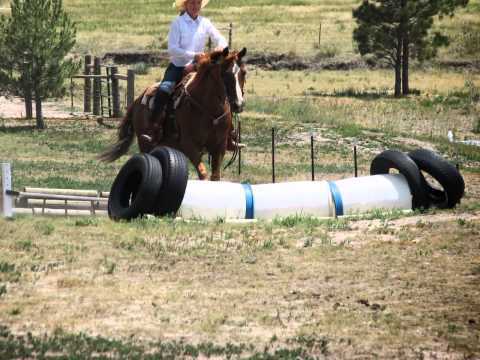 Kelly Hendricks of Pikes View Ranch in Conifer is another local that was invited with 30 other riding instructors from across the nation to be a part of the first “Train The Trainers” seminar this past month in order to learn the rules, tests and methods of the WDAA. With such a strong membership and presence in the organization of WDAA, Colorado will have many opportunities for horse people in our area to participate. My research for this article convinced me to join and I look forward to my first chance to get involved. If you have been hesitant to get involved with an organization, training or clinics in the past, I challenge you to give this one a try. Andrew McWilliams of MtnHomes4Horses.com wants to pay for an introductory lesson to Western Dressage with Kelly Hendricks for two area riders. Submit a short email about your horse journey to [email protected] to be considered. Visit WDAA at www.westerndressageassociation.org or the Colorado Affiliate at www.wdaco.org for a full explanation of Western Dressage, listings of upcoming events and demo videos. Great experience on a challenging high-end transaction. The deal took considerable negotiation and had a relatively short time frame.